All boys who register with us tonight will receive a free Cub Scout model rocket kit and a free day camp experience. Please bring along your checkbook as we'll be collecting registration fees. New members joining Cub Scouts should be prepared to pay roughly $59 in total fees. As new members of our pack, your son's whole family is invited to Cub Camp Blast Off. Join us there Sunday, October, 26. 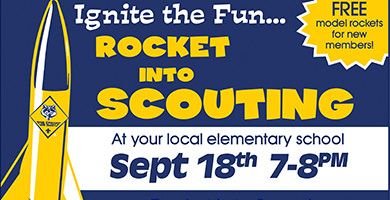 Scouts will launch their new rockets and have a fun fall day camp adventure with you. All adults, new Scouts, and siblings under 5 are free. Siblings over 5 cost is $10/each. Although Cub Camp Blast Off is free for most, we will still need to register you. For now, please save the date. We'll follow up with you tonight about signing your family up. We'll all have a blast at the historic Kiwanis Scout Camp in nearby Marine on St. Croix. This event used to be called Fall Festival day-camp, but this year they're making it even better with rocket launches! Our Pack Committee has planned a great year and we hope you'll join us for the fun. See you tonight as we rocket into scouting!